Home > Construction Training Manuals > Builder 3&2 Volume 01 > Figure 1-2.Labor Codes. purposes, all labor is classified as either productive or overhead. 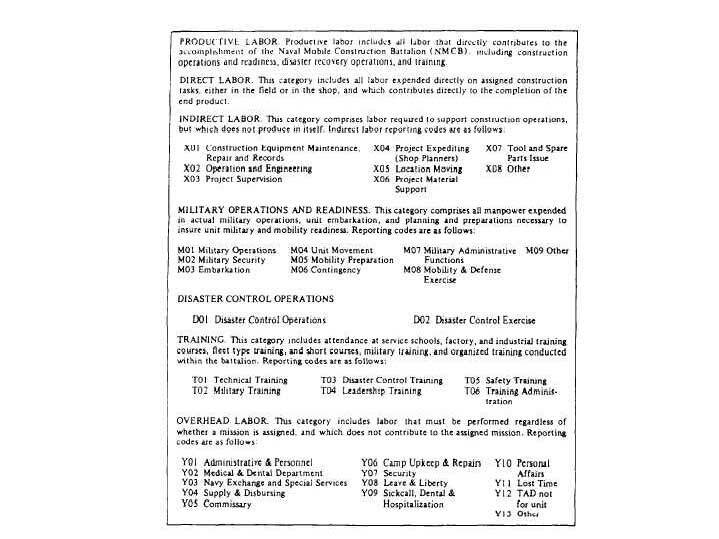 Labor codes are shown in figure 1-2. Productive labor either directly or indirectly contributes to the completion of the units mission, including construction operations and training. It is broken down into four categories: direct labor, indirect labor, military operations and readiness, and training. Direct labor includes labor expended directly on assigned construction tasks contributing directly to the completion of an end product. It can be either in the field or in the shop. Direct labor must be reported separately for each assigned construction task. Indirect labor is labor required to support construction operations but not producing an end product itself. Military operations and readiness includes work necessary to ensure the units military and mobility readiness. It consists of all manpower expended in actual military operations, unit embarkation, and planning and preparations. Training includes attendance at service schools, factory and industrial courses, fleet-level training and short courses, military training, and organized training conducted within the battalion or unit. Overhead labor, compared to productive labor, does not contribute directly or indirectly to the completion of an end product. It includes labor that must be performed regardless of the assigned mission. Figure 1-2. - Labor codes.